Over the course of a prolific two-decade career, South Korean writer-director Hong Sang-soo has made a consistent, compelling case for his modest artistic practice. His films are spare, talky affairs marked by a professed avoidance of “clichéd ‘beautiful images’” and put together with the barest of means. In recent years, Hong’s filmmaking process has only become more pared down: He writes scenes when he gets up each morning, calls the actors to set, and then shoots chronologically. Grass, his second film to get a Stateside release this year (after Hotel By The River), continues in this pattern, and may be the purest expression of this working method to date. Kim Min-hee plays Areum, a writer who spends much of the runtime in the corner of a small café, eavesdropping on her fellow patrons and observing their respective micro-dramas. There’s a young couple (Gong Min-jeung and Ahn Jae-hong) whose mutual friend committed suicide; an aging actor (Ki Joo-bong) who quit his theater troupe and is now looking to an old flame (Seo Young-hwa) for help; and a self-absorbed screenwriter (Jung Jin-young) trying to convince a young woman (Kim Sae-byuk) to join him on a 10-day writing retreat. All of their conversations Hong captures in languid, unshowy long takes—though when these exchanges break off, the camera often turns to Areum, whose thoughts and writing (relayed in voice-over) comment on and extrapolate from what’s just transpired. It quickly becomes clear that what we’re seeing is, if not entirely made up by Kim’s silent observer, at least filtered through her consciousness. For the viewer, it’s like watching life and art collide in real time. This shouldn’t be surprising, exactly, since Hong’s filmography—which largely features characters involved in the film industry, directors especially—has long navigated the porous borders of personal artistic expression. Understandably, this preoccupation only intensified after his extra-marital affair with Kim Min-hee spawned a major media scandal in South Korea in 2016, culminating in the one-two punch of On The Beach At Night Alone and The Day After. In Grass, though, the searching ache of those films seems to have curdled into bitterness. Here, Hong observes a woman who keeps a measured, stoic distance from daily life—the better to preserve its artistic potential. During a brief detour from the main café location, Areum (also the name of Kim’s character in The Day After) meets her younger brother (Shin Seo-kho) and his girlfriend (Ahn Sun-Young) for a meal, but then proceeds to harshly berate them when they say they want to get married. She’s not precisely wrong to point out the potential troubles they might face, but she’s also cruelly indifferent to their emotions, and even scoffs aloud at their earnest paeans to love. For her dispassionate outlook, there’s no better stylistic analogue than Grass’ soundtrack, which is made up of classical music—the café owner’s preference—that’s often comically unsuited to the tenor of the film’s various conversations. Given its focus on Kim’s flâneur-ish observer, Grass plays like Hong’s spin on the centerpiece scene of José Luis Guerín’s In The City Of Sylvia, in which a man sits at a café, distracted in his search for a woman by all the beauty around him—which for him mainly takes the form of other beguiling women. In essence, Guerín’s film is an ode to artistic pursuit that nonetheless reveals the limits of such activity. 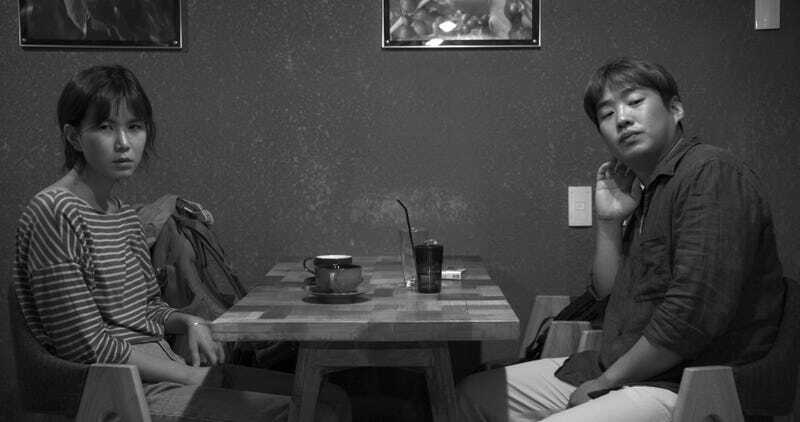 With no less integrity, though with entirely different stylistic means—Hong’s melancholy, black-and-white languor is a world away from Guerín’s sun-dappled searching—Grass explores a similar predicament. By the end of the film, Areum is forced to reckon with the very people she so casually, even callously inserted into her writing. It would be too easy, though, to see Areum (whose name translates to “beauty”) as an author/director stand-in. If anything, the café owner—unseen and unheard throughout—might be a more appropriate Hong surrogate. 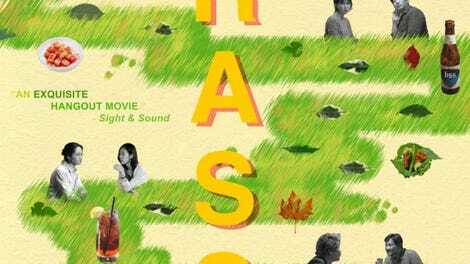 After all, what’s most fascinating about Grass is the way Hong modulates the film’s atmosphere, gradually transforming its banal beginnings into something genuinely haunting and unresolved. As the film’s various loose dramas converge, the sense we are left with is of lives progressing outside of our purview, with their fundamental unknowability—and thus immensity—finally restored. Significant in that regard are the fleeting shots of the potted plants just outside the café—the only overt reference to the film’s enigmatic title. Unburdened of any story significance, these images remind us of growth free from the vagaries of human experience, of beauty untethered from artistic imposition.